El hijo del británico murió tras caer por la ventana de la planta 45 del edificio donde vivía: "El teléfono sonó y era Lori (del Santo, madre del niño), estaba histérica y gritaba que Conor estaba muerto. Pensé que eso era ridículo, ¿cómo podía estar muerto? Entonces le pregunté la cosa más estúpida del mundo: ¿estás segura? Ella me contó que se había caído por la ventana y le dije que enseguida iba para allá". 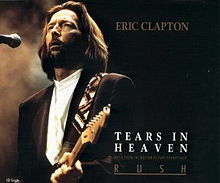 Eric Clapton had never been so clear and graphical at the moment of speaking about this dramatic moment of his life that led him to composing the song Tears in heaven The son of the Britisher died after falling for the window of the plant 45 of the building where they was living: " The telephone sounded and, Lori (del Santo, mother of the child), was hysterical and she was shouting that Conor was dead. I thought that it was ridiculous, how could he be dead? Then I asked the most stupid thing of the world him: are you sure? She told me that he had fallen from the window and I said to her that immediately I was going there ".